KYLE BUSCH/RICHARD CHILDRESS FIGHT VIDEO? Who the hell gets in a fist fight with somebody’s grandfather following a NASCAR Truck Series race? Answer: Kyle Busch, of course. Multiple reports have Busch brawling with 65-year-old NASCAR owner Richard Childress. Hilariously, Childress reportedly put Busch in a headlock and repeatedly punched him in the face. Childress was angered because Busch bumped one of his drivers, Joey Coulter, after the race. Busch reportedly “tapped” Coulter who finished ahead of him in the race. Busch is actually still on NASCAR Double Secret Probation for his recent childish debacle with Kevin Harvick at Darlington. The cartoon South Park premiered its 14th season with a brutal parody of NASCAR. The latest episode had the character Cartman becoming a professional auto racer and trashed the sport of NASCAR and its fans. Multiple drivers say they are not offended by the parody. Even Indy racer Danica Patrick (who was killed off in the show) said she enjoyed the cartoon. 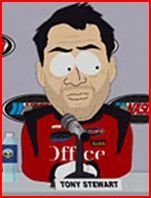 The cartoon made fun of “poor and stupid” NASCAR fans as well as product placement for Vagisil. Ryan Newman is the only NASCAR driver with a college degree. Newman received a B.S. in structural engineering from Purdue. Of course, had Newman spent 15 minutes watching the Discovery Channel instead of Fox, he would have found out it took the guys from MythBusters less than one episode to fly a flag in a vacuum and PROVE we landed on the moon. Apparently, the mechanical engineering department at Purdue, Newman’s alma matre, doesn’t teach its students about basic concepts like inertia and momentum. Also, it’s hilarious that Purdue University just happened to conduct the number one moon-landing-conspiracy debunking study ever published. Basically, that study concluded only idiots believe we never walked on the moon. Never the less, up to 28% of Americans believe all of the Apollo launches were faked and we never walked on the moon. As Deadspin.com asks, what’s a scarier prospect for NASCAR drivers? The prospect of having to race at 200 mph and sharing the track with a guy on meth or racing against someone who first started racing in the Truman administration. Hershel McGriff is 81. He not only competed in the NASCAR Camping World West event in Portland this weekend but he finished the race in 13th place. McGriff used to race in NASCAR and actually won four races. He later moved to Oregon and competed in races in the West where he won another 37 times. McGriff was eventually inducted into the Motorsports Hall of Fame. Several Internet and newspaper outlets are running stories about popular female Indy Car driver Danica Patrick possibly making the switch to NASCAR. The articles range from Patrick replacing Dale Earnhardt Jr. at Hendrick Motor Sports to the economic shot in the arm she might provide to sagging NASCAR attendance numbers. It’s been a bad year for billionaires. Forbes magazine came out with their annual list of the world’s billionaires, and among the casualties of the current economy is Las Vegas Motor Speedway owner Bruton Smith. He is no longer listed as a billionaire. 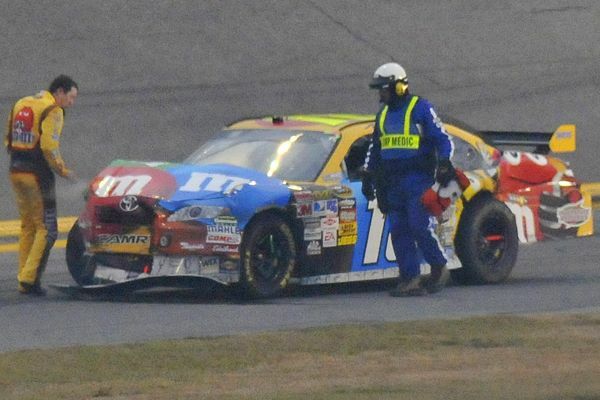 KYLE BUSCH LED FOR 88 LAPS BEFORE BEING KNOCKED OUT IN CRASH CAUSED BY DALE EARNHARDT JR.